This summer, don't get stuck in a rut, making the same old slaw you've been mixing up for decades... Invite a few different ingredients to the party! 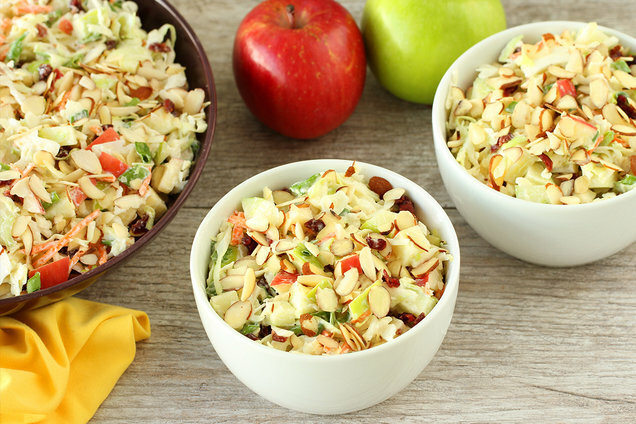 Apple and cranberry work PERFECTLY in this delicious warm-weather side dish. In a large bowl, combine yogurt, mayo, vinegar, and sweetener. Stir until uniform. Add all remaining ingredients except almonds, and stir to coat. Stir well, and top with almonds. Hungry for More Healthy Summer Side Dishes? Today, June 28th, is National Tapioca Day. These days, chia trumps tapioca... Try it in this Berry Chia Breakfast Bowl! Make sure your pals have these BBQ-perfect recipes... Click "Send to a Friend" now!